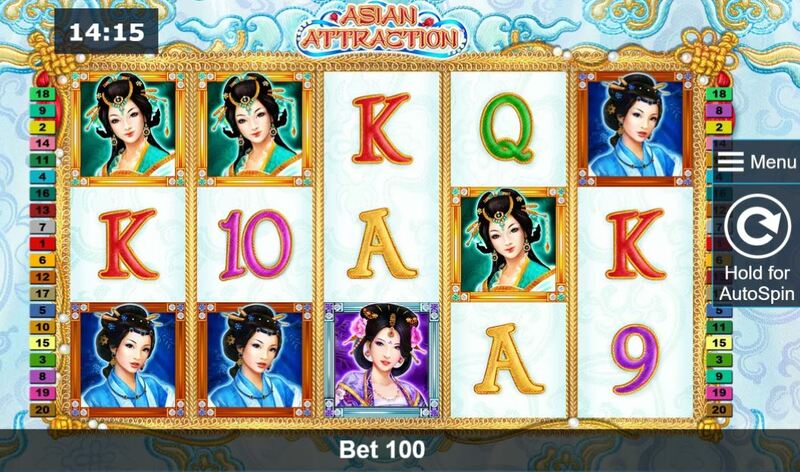 Asian Attraction slot is a realively rare theme from Novomatic, who until recently, didn't seem to have a propensity to churn out continuous Oriental-themed slots. We still get the usual mechanical sound Novomatic slots have when the reels stop but of course we have the addition of pipe-and-gong Japanese music and effects added this time. The word 'attraction' may tell you the subjects are attractive girls from the Far East, judging by their pinned hairstyles are meant to be Geishas. So do we have a sprinkling of Eastern promise here? We begin with the lower pays being formed of the usual card icons which the designers haven't even bothered to make Japanese-style. There are 20 pay lines over 5 reels and 3 rows and our four gorgeous Geishas make up the premium symbols, which like all appear singly on the reels. The pink Geisha pays 25x bet for 5-of-a-kind, the green 15x, the purple 12.5x and the blue 10x bet. The Asian Attraction Wild appears on the centre 3 reels but doesn't multiply or double up as a scatter: we leave the that to the Pink Lotus Flower which appears on all 5 reels. The symbols all need a minimum 3-of-a-kind to pay, unlike many Novomatic slots like Book Of Ra where 2 premium icons will award a win. So if we land 3 or more Pink Lotus scatters we are award the game's only bonus, a free spins round. 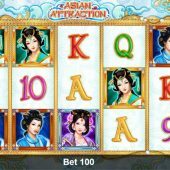 There are retriggers possible too and you can earn 3 extra spins by seeing the special framed Lotus Flower land on reel 3, the only place it can appear. This because the reels are enhanced with super-stacked Pink Geishas, the highest-paying icon. There is no multiplier so this effectively gives you the chance to win the slot's highest screen, 500x bet.